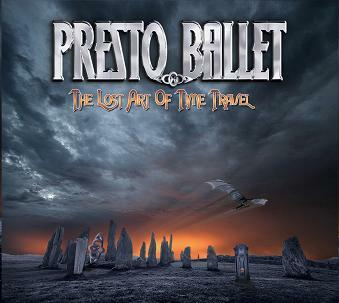 Presto Ballet is a sort of side project for Metal Church guitarist, Kurdt Vanderhoof. This is their second record, the first was released in 2005. I was really caught off guard by this record. It is truly a late 70’s commercial progressive rock record like Kansas or Styx would have made. They also use a lot of analog gear and try to go for that vibe but the production is too clean and not as rich as the 70’s analog recordings. This is an impressive CD with 7 tracks in one hour. The CD opens with the 10 minute The Mind Machine and man, you get thrown back to the mid 70’s Kansas sound. Scott Albright sounds more like DeYoung from Styx than Steve Walsh though. Impressive song. Thieves, 9 minutes in length, begins quite dark and ominous before a very contrasting happy guitar line kicks in and some synths and away we go in a very different direction from where we started. It develops into a more commercial track but also powerful stuff with nice solos. You’re Alive is a 4 minute acoustic guitar driven track until the end when the power chords strike to give it that effect, you know…. One tragedy at a Time is 14 minutes long and has so many parts it is hard to describe. Just get sucked into this amazing track that reminds me of classic 70’s rock in the world where Kansas and Styx lived. I’m not Blind begins quite beautifully but then is suddenly interrupted by the monster guitar riff. Sadly, there are quite few guitar solo on the record but this song features a nice melodic one. Easy Tomorrow is an uptempo rocker and one of my favorites. The CD ends with the 9 min track, Haze… This is for sure not Metal Church but fans of Kansas and 70’s Styx will really appreciate this cool CD.